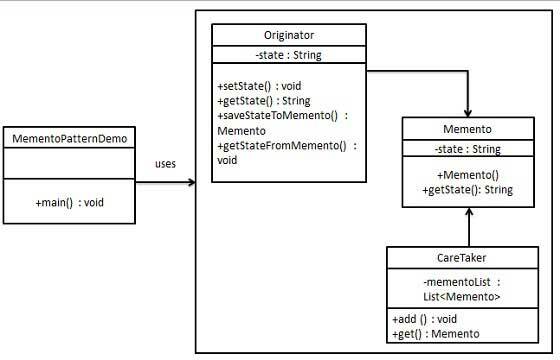 Memento pattern uses three actor classes. Memento contains state of an object to be restored. Originator creates and stores states in Memento objects and Caretaker object is responsible to restore object state from Memento. We have created classes Memento, Originator and CareTaker. MementoPatternDemo, our demo class, will use CareTaker and Originatorobjects to show restoration of object states. Use CareTaker and Originator objects.